Every so often, God speaks to me in riddles. Or perhaps puzzles is a better word. He will give me something — an image, a word, or both — that doesn’t make sense on the surface of it. It’s like I feel my mind grab hold and start worrying it like a dog worries a bone. What does this mean??? The first time I recall waking up with a word resounding in my head was when I dreamed of looking into a pile of embers and seeing a decomposing fish. It was strange, because the embers were obvious hot and should be cooking the fish, but it was rotting as if the heat meant nothing. And when I woke, the word ENTROPY was emblazoned across my inner forehead. It was a commentary on my health and fitness. I’d spent decades ignoring my body and not investing attention and time towards being fit and healthy. It was time for that to change. 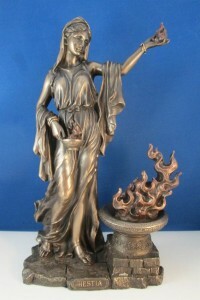 Sure enough, I woke and there it was, still: Hestia. I reached for my cell phone and did a quick Internet search. It was the title of an anime show. And it was the name of a Greek goddess. As soon as I saw the role of the goddess, I knew that was the one God was talking about. 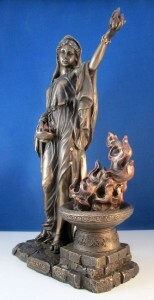 Hestia is the goddess of hearth and home, of family and domestic affairs. All of my life I have desired adventure and heroic action and despised the idea of “just” staying at home and raising a family. As a child I declared, “I’m never getting married!” As a teen I found that I desired romance, but still declared, “I’m never having children!” But as I studied God’s word with my husband, I discovered that He created man and woman to have families. So eventually, 10 years after getting married, we had children. But the resistance to home and family and domestic things runs deep. And I mean DEEP. Subconsciously, I associate homemaking as the very worst enemy of creativity, adventure and finding meaning in life. It is my nemesis. Being a wife and mother is the thing that traps women in iron chains, makes them of no value to anyone except as slaves who provide food and clothing so that the other family members can go out and have adventures. It robs them of any chance to make beautiful art or to change the world scene. It bogs them down with mundane and meaningless tasks that never end: laundry, cooking, cleaning, grocery shopping. I’m not sure why this feeling is so deep or where I got this idea. Both my parents worked, so I don’t recall seeing my mom “trapped at home” with her talents and skills wasting away. However, when I was growing up, my parents were in a very authoritarian, patriarchal Christian cult, and “women have their place in the home” was a big part of that. So perhaps that was the source of this twisted view of domesticity. Whatever the case, God decided that it was time to continue renewing my mind on this topic. So He painted me a different picture. And because He is the one who formed me, who knows me, and who loves me for who I am, He speaks to me in a language that I love, a language that I understand. The language of myth and legend, of stories and dreams. She is the firstborn of the Olympian gods, older sister of Hera, Demeter, Poseidon, Hades, and Zeus. I am the firstborn of five kids. I understand firstborn responsibilities and I associate being the firstborn with great blessing and the largest portion of the inheritance. It’s a good thing. She is honored with the first offering of every public sacrifice, and during home worship was given both the first prayer and the last. This is no small role, no forgotten goddess (although we may have forgotten her because she is not often depicted in art and performed no antics in the tempestuous and dramatic tales of the Greek gods’). She was central to life. She was practical and not pretentious, sitting on a simple wooden throne with a white wool cushion. She didn’t get involved in all the ridiculous and petty politics of the Greek gods, but stayed to keep the fires of Mount Olympus burning. She was a hospitable and calming influence. That’s how I want to be. When a new town was settled, a flame from the public hearth of the original hometown of the settlers was brought to the new hearth. The public hearth was a place of refuge and asylum for visitors, and the fire was always burning. I want my home to be a place of refuge to others. 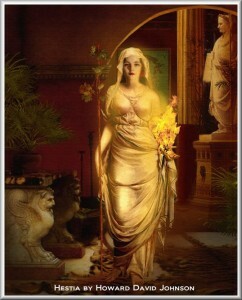 She is a virgin goddess, having rejected both Apollo and Poseidon as suitors and choosing to remain chaste. 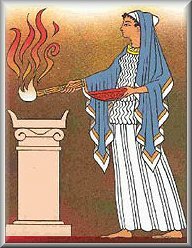 While I have a wonderful husband and love life, and therefore am not chaste, this aspect of Hestia would be an inspiration were I a single mom or widow. And it appeals to me that she is highly valued even apart from any role as a sexual partner. 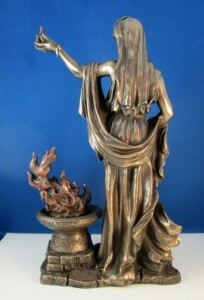 I love that Hestia is depicted in art with fire. One of the names that God has called me is Torchbearer. I am to bring His light into every place I go, to shine light into dark places. How beautiful to realize that the torch I carry comes from the flame of the hearth. The strength of my light is founded and supported by the flame I keep burning at home. There is a place I can go to replenish my flame… a place whose quality is dependent on my care. Epiphany: The home is both a source of strength and something that requires our care. Give home fires their due and they will sustain you and your family and your community. How does Hestia change my everyday life? When reprogramming my mind from hating domestic things to embracing them, I might struggle to put God’s way into a concise affirmation. There are many aspects to running a home. There are times when a single scripture is what I need to renew my mind in an area. And this time, it is a single word, laden with connotations and the layers of imagery surrounding it, that recenters me on the value of any domestic thing that I do. 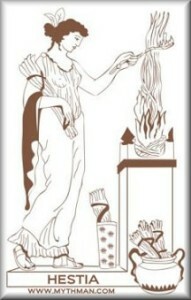 When I am resenting yet ANOTHER load of laundry, I simply think, “Hestia,” and I am suddenly a goddess who is keeping the life-fire of my home burning. I am nurturing and shaping the environment so that my children feel safe and learn responsibility and love. Wondering whether it’s biblical for someone to see an image or hear a word and then for God to explain to them what it means? It happened all the time to people in the Bible. God showed Jeremiah an almond branch and then told him that it meant God was ready to perform his word. God showed Pharaoh two dreams, both with the same pattern. Joseph interpreted the meaning and knew that it was repeated so that Pharaoh would know that it was certainly going to happen. God gave Ezekiel a story about an eagle and a tree and explained that it was really about international politics. What’s your favorite example (biblical or personal) of God using parables, imagery or other mysterious things to speak to someone? Leave a comment below! This entry was posted in Epiphanies and tagged dreams, hestia, mysteries, puzzles. Bookmark the permalink.